What is blanket yoga and how can it help you stay cozy (and calm) this winter? On the list of ways to unwind, there are few things that sound as relaxing as staying under the covers or taking a super-chill restorative yoga class. So, imagine what it would be like to combine the two? That’s basically the concept behind Kambal Yoga, a new form of the ancient practice, which Stephanie O’Hanlon Kayalar, RN, created to help cultivate more chill vibes in her own life—and those of the students who come to Restore Balance, her integrative wellness center in Glen Falls, NY. Intuitively, though, it makes sense. Think of how good you feel whenever you get into bed and pull up the comforter (I mean, the name alone says it all)—it’s like suddenly all is right in the world, right? The weight doesn’t feel as though the walls are closing in; it sort of hugs you like when your mother tucked you in snug and safe. And while everything thus far sounds pretty much the same as any hygge night at home wrapped up in a big blanket, here’s what the practice is actually like: Kambal combines body scanning, yoga nidra (a guided meditation done while lying down), restorative poses, reiki, massage, and inspirational readings. I can attest to the chill-ax effect the class had on me. The first pose is always a reclining bound angle (more on that below). The blanket covers you from around your chest to your toes, an eye pillow is placed on your face and sandbags anchor your upward facing palms to the ground. The weight doesn’t feel as though the walls are closing in; it sort of hugs you like when your mother tucked you in snug and safe. As I was lying there listening to my body, opening my heart, and finding my breath, I discovered that ever elusive inner balance I so truly crave. Something else I learned my heart desires? Having another excuse to stay under the covers. Read on for 4 super-restorative blanket yoga moves you can do at home. 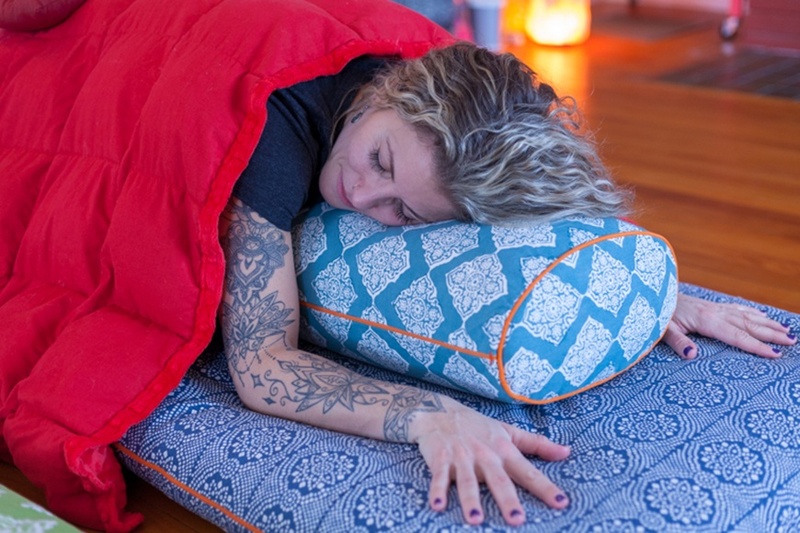 To start a Kambal Yoga practice at home, you can get the same weighted blanket used in class (or layer a few chunky ones of your own to create a similar effect). Once you’re comfy in each of the moves below, place the covers on top of your body so you’re covered from neck-to-toe. Do a bolstered savasana (AKA a reclining bound angle). “Lie on your back with a [regular] blanket or towel underneath your head and put [another one] underneath your knees, allowing your toes to fall out and your heels to come in and relax,” instructs Kayalar. Along with making you more chill, certain yoga moves can help boost your immune system. And when you can’t hit the mat, try these tried-and-true stress-relieving tips.